Hard to assume, but Yokosuka D4Y Suisei dive bombers was quite successful as dive bombers. Successful = they worked as long fuel and pilots where there, perfect/as they intend too. Battleships: An Illustrated History of their Impact. Weapons and Warfare(2004). Nice, thanks! Need some guesstimate for the Hyuga then. What if scenario, if Japan has no shortage of experienced pilots, planes, and oil; but still in short of carrier due to Midway; does Ise/Hyuga conversion could be successful? Or useful at least? Also interesting choice for using dazzle lines for the turret on Haruna. Maybe to make the turret looks like patrol boats? Or it is common in japan to use dazzle lines for coastal gun? Interesting, any reference on how the camo pattern painted on their hull? Im guessing IJN Hyuga was almost the same just the patches in a slightly different place and shape (?) but not much. The most bizarre camo was IJN Haruna's and is also hard to do correctly in 1/700 too(good luck painting camo on 12,7 cm AA barrels...) ! 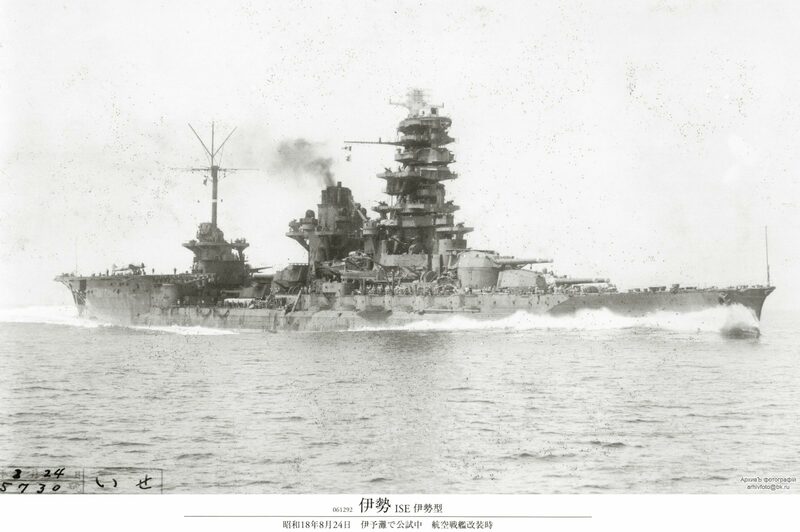 Im guessing IJN Hyuga was almost the same just the patches in a slightly different place and shape (?) but not much. The most [i]bizarre[/i] camo was IJN Haruna's and is also hard to do correctly in 1/700 too(good luck painting camo on 12,7 cm AA barrels...) ! Yes, IJN Hyuga had same camouflage pattern, IJN Haruna too but with stripes instead of patches like the IJN Ise class. 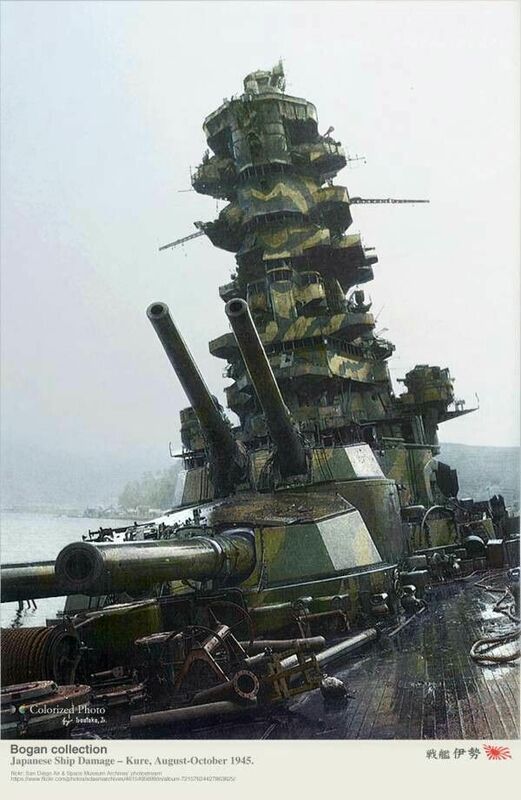 IJN Nagato had a camouflage patern too, but quite different. Interested to convert my ongoing Hyuga build into this camouflage. Is there any other reference on this camo pattern? Does Hyuga got similar camo treatment? Me ! My only problem was the turrets, they are over scaled. I replaced mine with a old Haseqawa one, but a slight modification will be needed cause they for a '40's fit. Me ! My only problem was the turrets, [b]they are over scaled[/b]. I replaced mine with a old Haseqawa one, but a slight modification will be needed cause they for a '40's fit. Has anyone completed or done any work on the Samek 1/700 Ise 1917 kit or seen any reviews of this kit? This bulge appears to be pretty flat on top, while many other navies had curved bulges. The flat top shape greatly reduces manufacturing cost. That is the most likely reason for the shape. The added torpedo bulge is all metal plating. I noticed that Hyuga doesn't have sloped side deck like Ise (see images). I wonder what floor material used for that extended side? Is it a wood or metal? Does it changes in her hybrid form? This is as we say comparing apples to oranges. You have Hyuga before rebuild compared to Ise after rebuild. You have highlighted the hull bulge added during the rebuild from 1934-1936. I also found this has been confirmed by Atma in here. I assume Hyuga got similar treatment. So, the question remains, is the floor extended using wood or metal? I also found this has been confirmed by Atma in [url=http://www.shipmodels.info/mws_forum/viewtopic.php?f=47&t=5565&start=160#p481186]here[/url]. I assume Hyuga got similar treatment. I agree that the Tam Tam model is a fantastic reference. For now i try to imitate TamTam's IJN Ise 1/100 (http://blog.livedoor.jp/nichirou/archives/54044794.html) while compiling all info from this amazing thread, especially the difference between Ise and Hyuga. I can't help you out on this; perhaps someone else can chime in. Model Art Ship Modeling Special # 53 (Autumn 2014) has a few pages of a comparative build between a Hasegawa and a Fujimi kit. With improvements and correction, though the pics are small. Yes, though portions of the upper row of portholes, particularly around the secondary casemates may have been left unsealed. They were there on trials in August, 1943, once they were converted to BBCVs. Would the hull scuttles on Fujimi's Ise (1/350) need to be blanked off if i'm building her 'as lost'? If so, What's the best way to do it? I note 1/350 Hyuga is now released as battleship-carrier, with general improvements. Atma, are there any rumours of a 1/350 all-gun version from your little birds? Thanks for mentioning the 1/700 Hyuga 1941 Dan... might have to get it as a 'study model'. Rear superstructure looks well done in the kit.